The ironSource Offerwall presents engaging offers to your users in exchange for valuable virtual content. This engaging, user-initiated ad unit is great for gaming and utility apps; and enhances every app experience! Make sure that you have correctly integrated the ironSource SDK into your application. Integration is outlined here. The ironSource SDK fires several events to inform you of the Offerwall activity and completions so you’ll know when to reward your users. Implement the listener to receive these Offerwall events. * Invoked when there is a change in the Offerwall availability status. * @param - available - value will change to YES when Offerwall are available. * You can then show the offerwall by calling showOfferwall(). Value will *change to NO when Offerwall isn't available. * Invoked when the method 'showOfferWall' is called and the OfferWall fails to load. * @param error - A IronSourceError Object which represents the reason of 'showOfferwall' failure. * Invoked each time the user completes an Offer. * Award the user with the credit amount corresponding to the value of the *‘credits’ parameter. * @param credits - The number of credits the user has earned. * @param totalCredits - The total number of credits ever earned by the user. * the app’s data). In this case the ‘credits’ will be equal to the ‘totalCredits’, and this flag will be ‘true’. * @return boolean - true if you received the callback and rewarded the user, otherwise false. * the user's credit balance info. * @param error - A IronSourceError object which represents the reason of 'getOfferwallCredits' failure. Please do not assume the callbacks are always running on the main thread. Any UI interaction or updates resulting from ironSource callbacks need to be passed to the main thread before execution. With ironSource’s Ad Placements, you can customize and optimize the Offerwall experience. This tool enables you to present the Offerwall to your users in various places, i.e. in your in-app store, between levels, in the main menu, etc. You can use the below function to define the exact Placement to show the Offerwall. Navigate to the Ad Placement document for more details. Make sure you’ve set the userID before you initialize the ironSource SDK in order to successfully reward your users. The default setting in your ironSource account notifies you of user’s completions or rewards via the didReceiveOfferwallCredits callback within the client of your app. Alternatively, you can turn on server-to-server callbacks to receive notifications to your back-end server. Once you select server-to-server callbacks you will not receive client-side notifications. We recommend turning on server-to-server callbacks for Offerwall instead of client-side callbacks, as the authenticity of the callback can be verified. 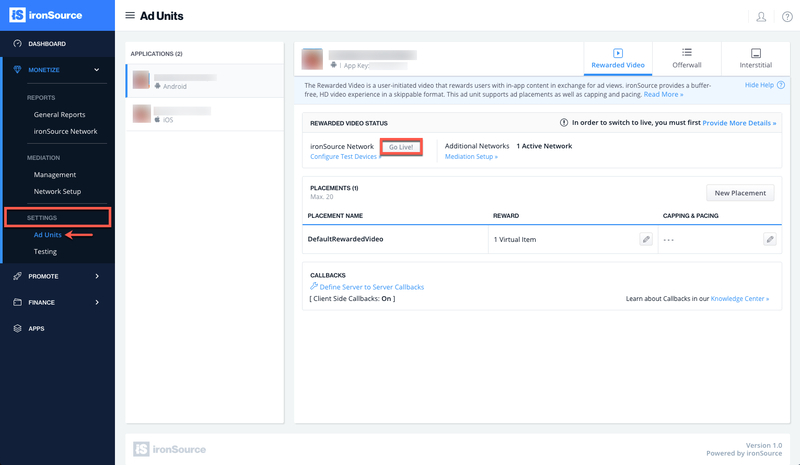 With server-to-server callbacks, you will have better control over the rewarding process as the user navigates out of your app to complete the offer. If you turn on server-to-server callbacks , remember not to reward the user more than once for the same completion. We will fire a server-to-server callback to the selected location with an Event ID which is the unique identifier of the transaction. For us to know you’ve granted the user, you must respond to the callback with [EVENT_ID]:OK anywhere within the HTTP payload of the callback. To utilize server-to-server callbacks, see here. You may call the function getOWCredits at any point during the user’s engagement with the app. You will then receive information on the user’s total credits and any new credits the user has earned. Important! This code MUST be implemented before calling the init. If you are using automatic client-side events, we recommend adding the proactive polling method and checking the user’s reward status on app launch, upon in-app store entry and in the case a user opened the Offerwall, ardently verifying every 5 minutes after the user closes the Offerwall to ensure you don’t miss the latest update on the user’s rewards. If this is a new integration for your application, your app will by default be in ‘Test Mode‘ on your ironSource dashboard. While your app is in Test Mode, the ironSource SDK will print more logs to the console in order to provide greater visibility into the SDK processes. To test your ad inventory, set up your Test Devices. Until you turn on live ad inventory, you will receive test campaigns that don’t generate revenue. Make sure to select Go Live! on the Ad Units page when your app is ready for live ad inventory. You are now all set to deliver ironSource’s Offerwall in your application.